SteelSeries, the leading global manufacturer of professional gaming peripherals, today announced the SteelSeries World of Warcraft® Wireless Mouse, co-designed with Blizzard Entertainment. Evoking some of the most iconic images from Blizzard’s massively multiplayer online role-playing game, the new Wireless Mouse brings players an ergonomic, 11-button layout, with illumination and pulsation options that help immerse players in the game. The SteelSeries Engine software guides players through an easy, in-game integration set-up with drag and drop functionality of World of Warcraft commands, full button remapping, macro creation and the ability to save an unlimited number of game profiles. “We brought to market the first MMO gaming mouse more than three years ago with Blizzard, and since that product launch, we’ve been working to improve and perfect what the MMO community has wanted and asked for – from the size and button shape to the hardware and wireless functionality. The World of Warcraft Wireless Mouse not only answers players requests, but we’re confident that it will impress players by arming them with state of the art hardware features and an exceptional user experience,” said Bruce Hawver, SteelSeries CEO. The sleek docking station features a matching rune design with white illumination along the outer rim; it operates as both the charger and receiver, which powers the World of Warcraft Wireless Mouse and is compatible with both Windows® and Mac®. For convenience, the mouse can also be wired by plugging it directly into the computer and the battery will charge while it’s connected and in use. 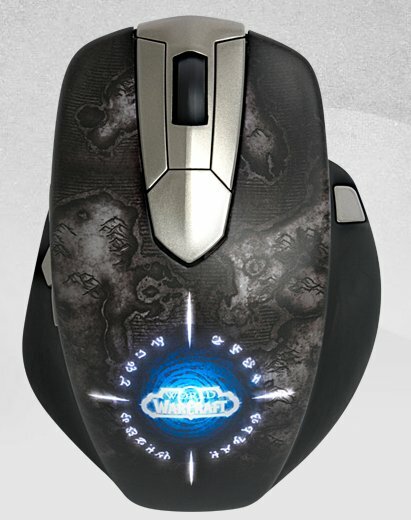 The World of Warcraft Wireless Mouse will be available in Q3 2012 on the SteelSeries Web Shop and in select retail locations for $129.99 / €129.99.